These adjustable powder measures are a must for safe and accurate shooting. Each is made of solid brass. Perfectly sized for revolver chambers and small-bore rifles. Accurately measures loads from 5-45 grains. 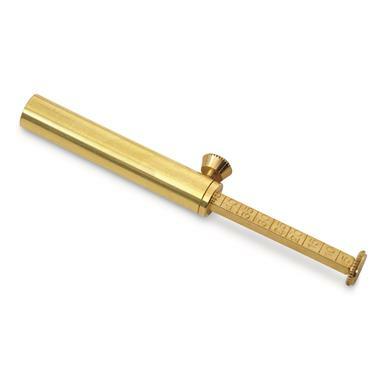 Traditions Revolver Powder Measure, brass is rated 4.3 out of 5 by 6. Rated 3 out of 5 by JimW from Wrong powder measure The powder measure I received is well made. But, it does not have the swivel funnel as shown in the catalog photo.This is the feature that was wanted in the measure. Rated 4 out of 5 by ALAN from It is a good product. I wish it had a product installation guide. The drill bit size and dry fit instructions would have been helpful... A video even better. Install or use videos for each product would be cool to have.